Greetings from Dublin airport. Its been a busy week – on Tuesday I hosted the first 4Humanities conference, at UCL, then jetted off to Galway, Ireland where on Thursday I keynoted at the Digital Arts and Humanities PhD Programme annual conference. The conference at UCL, entitled Showing the Arts and Humanities Matter gathered together various initiatives who are actively promoting the arts and humanities, to allow discussion regarding what is the best way forward to ensure that the benefits and contribution that the Arts and Humanities make to society is recognised. It was a fantastic day, and I learnt a lot – I’m fairly new to this area. Ernesto Priego live blogged and tweeted the event, and there is a storify of the tweets for those who want to catch up on the discussion. 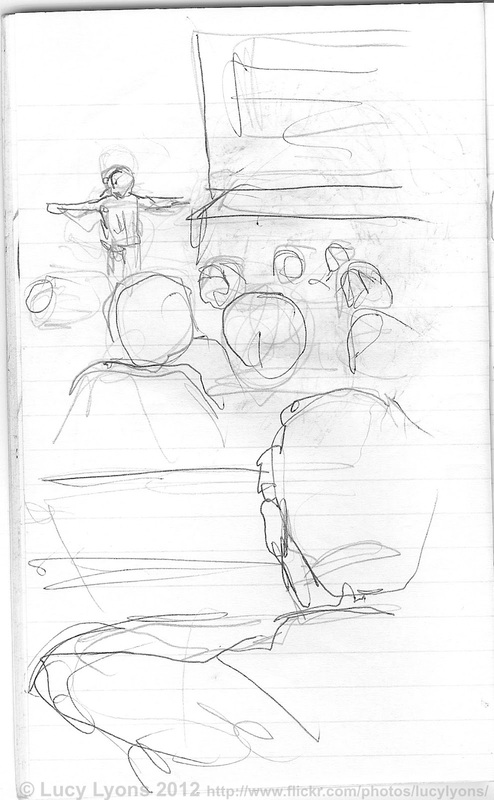 One thing we decided to do was have a practice based artist, Dr Lucy Lyons, as a conference artist in residence, sketching and note taking, using a different sort of technology (pen, pencil, paper) than the ones we usually use, in what she calls “a frenetic, haptic method of note taking and engaging with the speakers”. Lucy created a wonderful set of notes and drawings of the day that capture the flavour of the event. It is interesting to reflect that our discussions seldom wandered into talking about the practice led arts – and the fact that the immediate reaction of many speakers who saw Lucy’s drawings was “great! a new avatar for me on twitter!” (how we are all addicted) rather than a discussion of what integrating this process into the conference setting would show or tell us. I’m still processing that, myself – but I loved having a conference artist in residence, and hope to feature this again at future events. Time for me to check in, I’ll tell you about #dahphdie at another time! We used a practice based artist for our 1 day conference in the summer. We had a iPad artist in residence (you can see the artwork from the conference here: http://www.digitallearningnetwork.net/news-blog/guest-blogging-the-engaging-digital-audiences-in-museums-conference/) it was really interesting to watch her work throughout the day. I'm really interested in integrating this practice based process of recording events into a conference setting as it seems to trigger instant engagement. The process of creating the artwork in real time is fascinating to delegates, speakers and conference organisers alike, highlighting the atmosphere of the event, but its still to early to say if it is a useful device in terms of longevity and impact. I haven't quite got my head round that yet. Thanks for the right information Sharing.